She has balls as big as the state of New York! The last person on the planet Earth that should talk about indictments is Hillary. But, I guess she feels pretty assured about her own statues given that she benefitted by DOJ corruption that covered crimes she committed as secretary of state! AOL News reports Hillary Clinton has suggested that President Trump could, in fact, be indicted for any illegal activity he may have committed before being sworn into office. 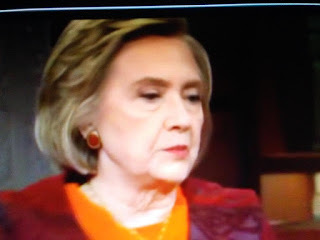 In this interview with Colbert Hillary Clinton talks about our democracy in crisis. But, everything she's says is classic Democrat projection. Accuse others for wrong deeds in fact Democrats and Liberals are committing.